The Meater looked like a great idea from the very start. 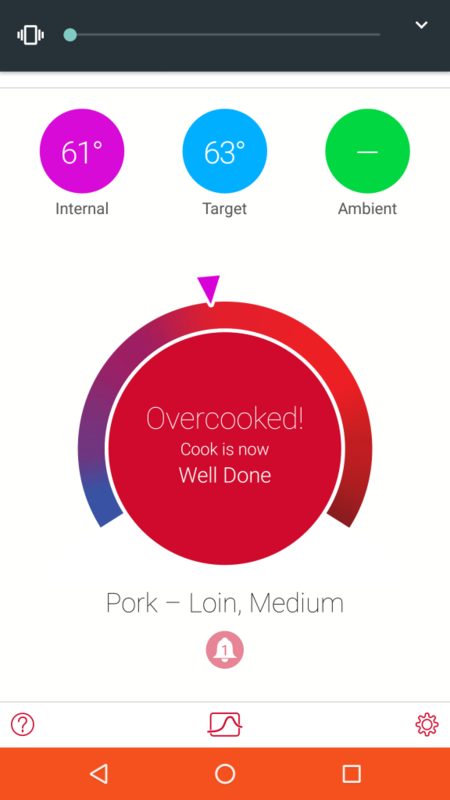 It is a wireless, blue-toothed meat thermometer that connects to a cell phone app to give you instant readings of the internal cooking temperature. Everyone knows the uncertainty of cooking an expensive piece of meat and being uncertain about how long it should cook for, or if one has a good idea of when to get the meat started in the choreography of bringing a full meal together. This goes double for the weekend-warrior who grills out (or breaks out the smoker) sporadically. The Meater looked full of promise, so I ordered one. To be fair, I did not exactly order one. What I actually did was contribute to their kick-starter campaign and received my Meater as a contribution “premium.” There is a difference between the two scenarios, though. When my Meater had not arrived within a month (and, thanks to Amazon Prime, we have all become used to almost instant gratification), I was frustrated, but not exactly surprised. What was annoying were the frequent emails from the founders of the company, telling me how great the product was and how much the folks who were getting theirs were enjoying them. They advised me to hang in there because my Meater was just around the corner. It finally arrived TEN MONTHS LATER! I was ready to dislike the product by then. Annoyed by the delay and angered by the endless, self-serving spin of the email, I expected the worst. 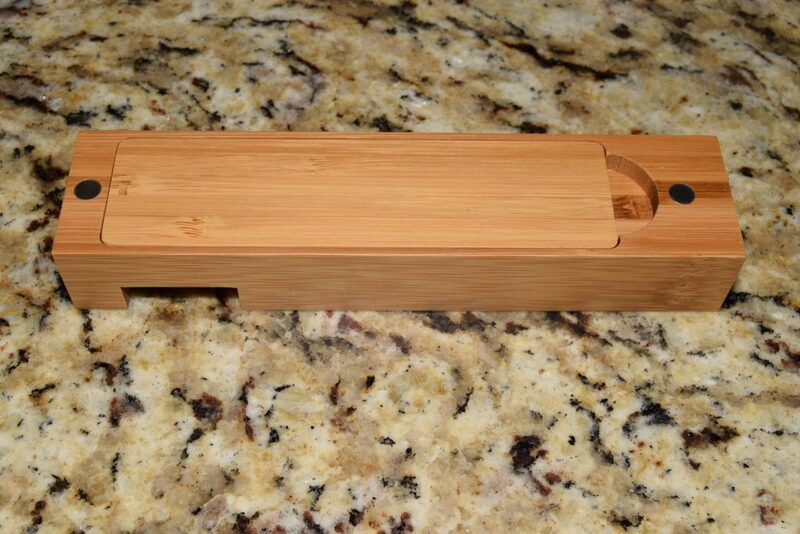 What arrived was an outstandingly polished product. 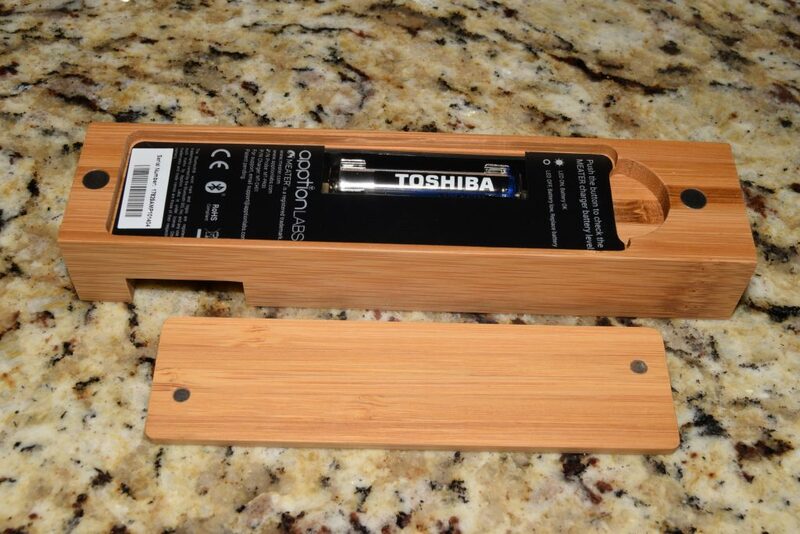 The packaging was impressive and the actual product was (I should say “IS”) beautiful. If I am going to pick at small details, the user instructions were printed a little small for my 55-year-old eyes. 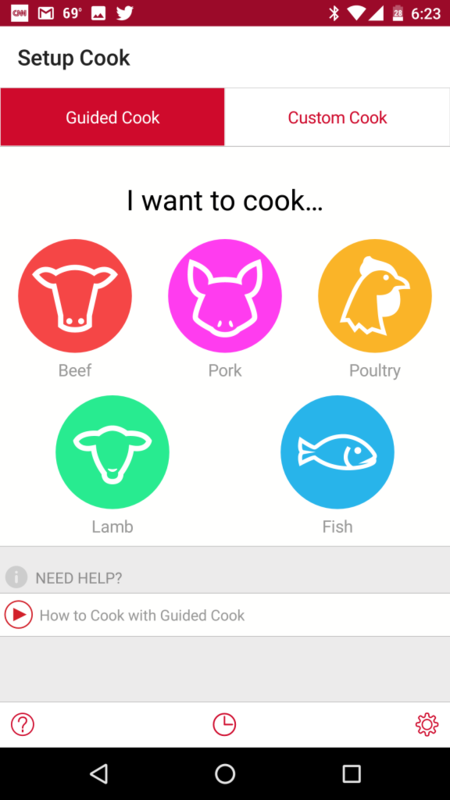 Having said that, once you have installed the app on your phone, there are lots of video instructions and lessons through the app. This is extremely well done. I hadn’t understood before it arrived, but the probe has two sensors, giving you an external temp (oven temp) and an internal (core temp) reading. That is useful to know. 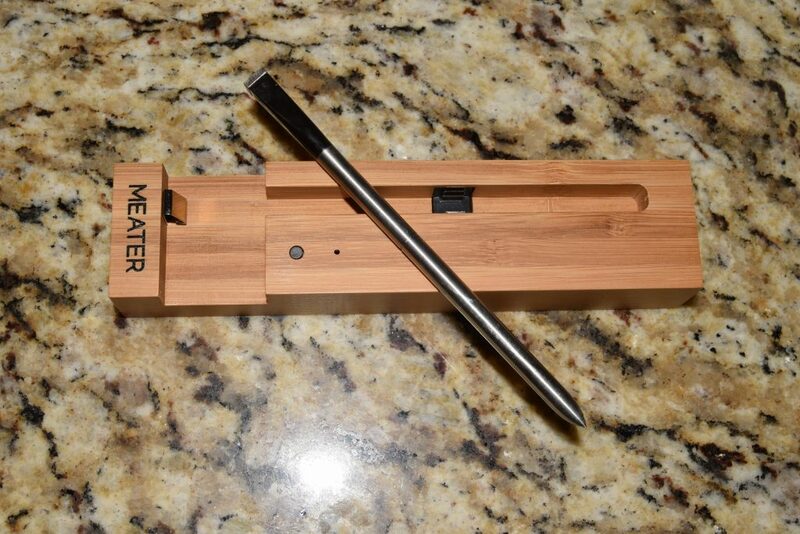 Consider using it in a sous vide bag (because I do not believe that the Meater is fully waterproof) where you can test the water temp and core temp at any time. 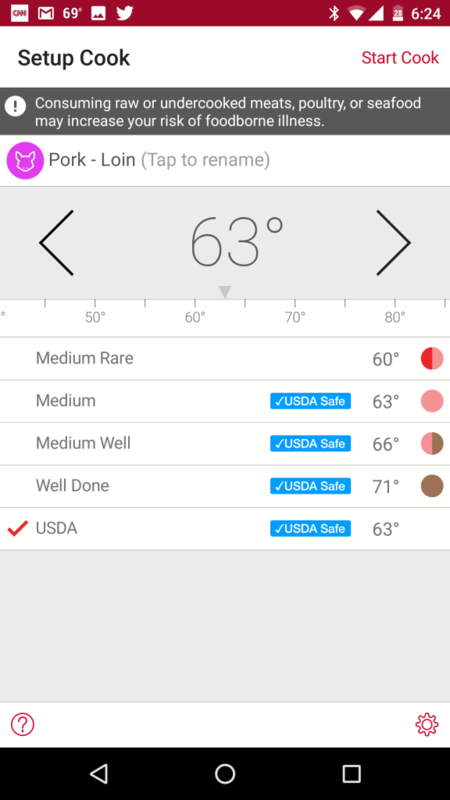 However, over and above this aspect, the app calculates the amount of time it will take to get to the desired core temp and alert you at a pre-set time when you need to know. Of, course, the app gives you a constant read-out of that information if you need it. 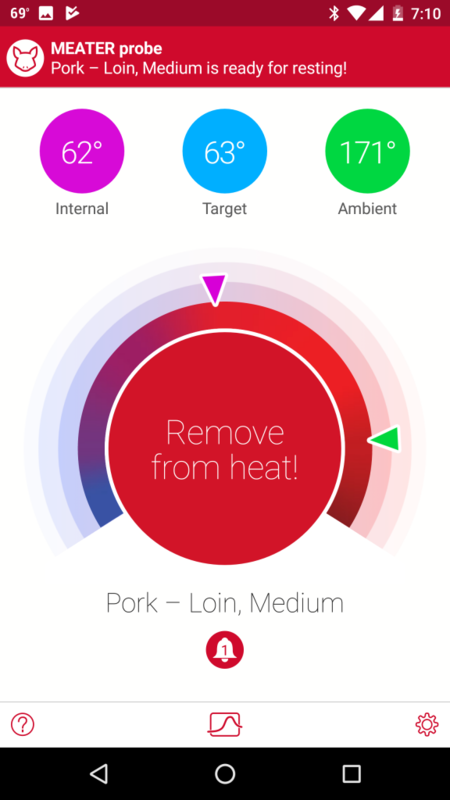 The app even offers you the recommended internal temp for a number of popular meats and cuts. So a lump of mystery meat of indeterminate size/weight is no longer difficult. 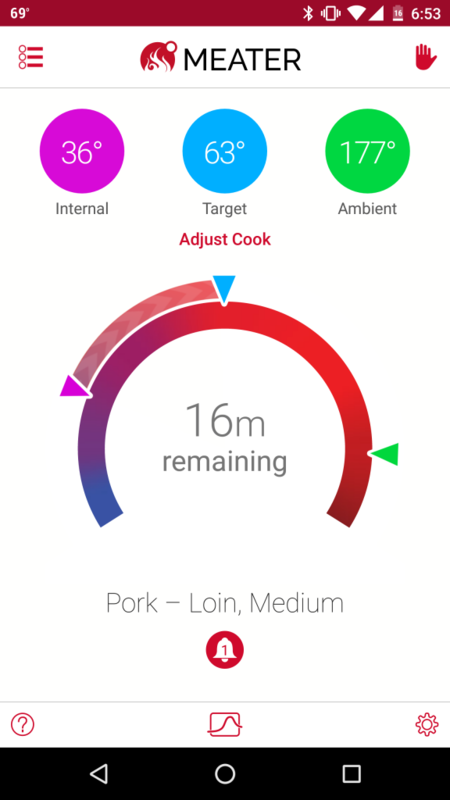 If your were to cook everything at 375 degrees, you would would never be far off AND the Meater will calculate the cooking time for you within the first five or ten minutes in the oven. This is a piece of pork – maybe a pound or pound and a half. I deliberately didn’t weigh it. It is also a weird cut = probably and off-cut of something else. I bought it for about two dollars. It was my favorite price – cheap! 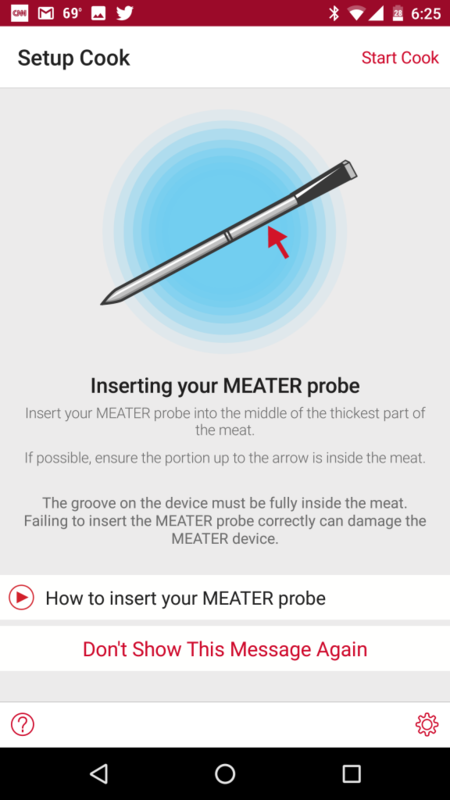 Provided that the Meater is properly inserted – and there are many videos and guides to help you, all we are worrying about is the core temp – which I set at 63 degrees. Now, I have learned a lot from the Meater. 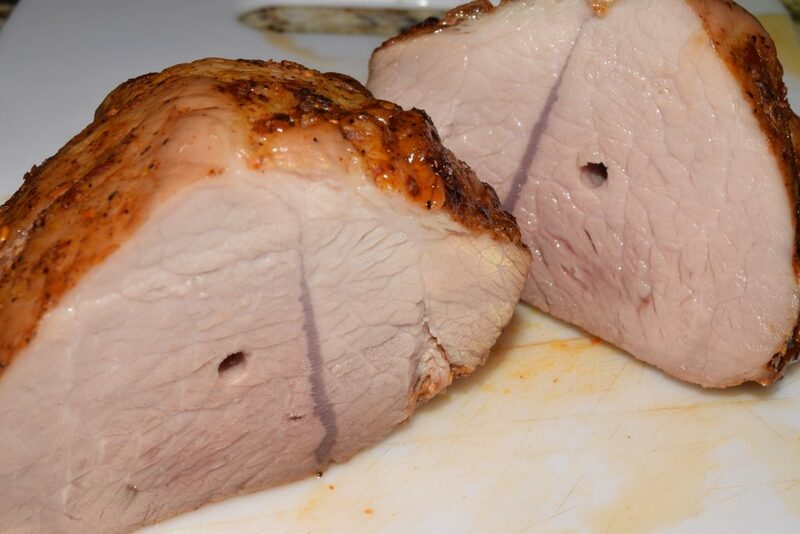 I was never a huge fan of letting meat rest and I always wanted to know more details about how much it “kept cooking” once it was out of the oven. I have used the Meater three times now and have learned that resting and taking the continued cooking is real and important. The alarm let me know when we headed into the last 5 minutes of cooking time and I removed it from the oven. By the time it cooled, I was getting this message! It wasn’t. It was actually juicy and just how I needed it for sliced pork in ramen. This is NOT a problem with the Meater. It is part of my education as a cook and I am all the more knowledgeable for the empirical data. So why am I less than happy with this item? 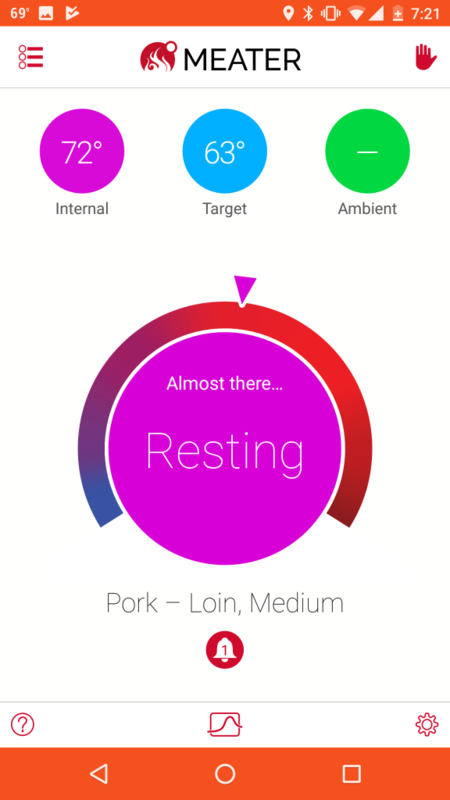 Get to know the below app screen. 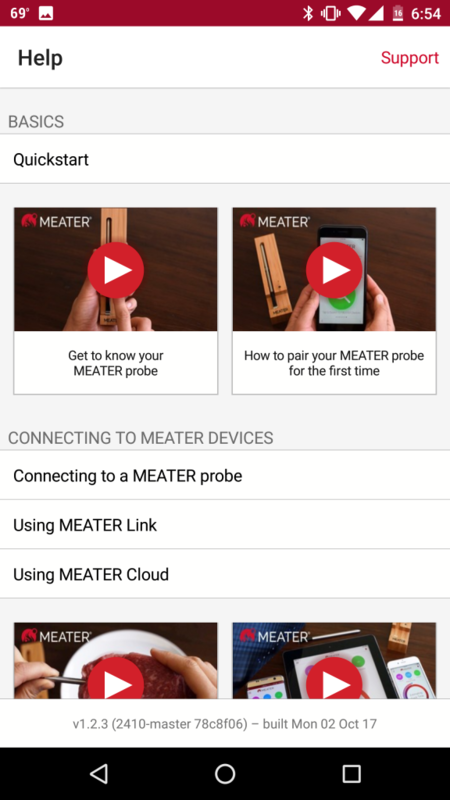 If you buy a Meater, you are going to see a lot of it. The company claims that the Meater, as is, has approximately a 10-meter (32 feet) range. When placed in my kitchen oven, the Meater’s range is less than 12 feet. I have measured it and it is consistent. 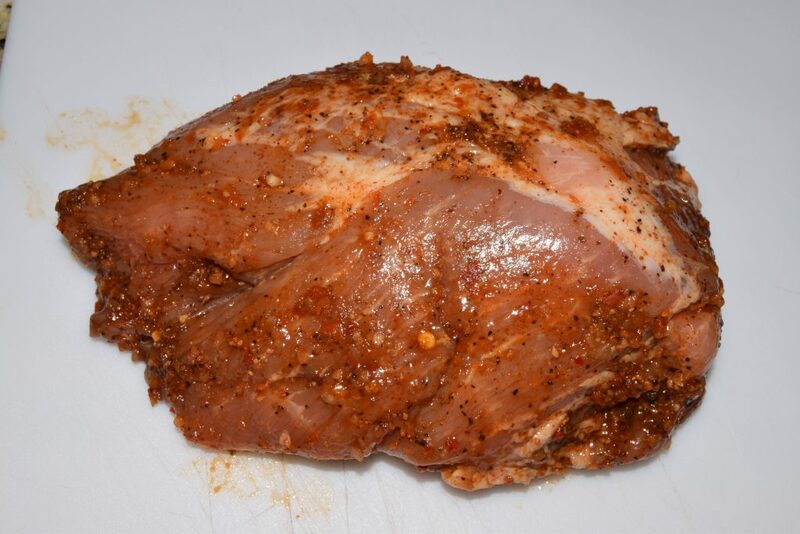 When placed inside a Webber grill, its range is less than 3 feet. Again, I have tested it and it is consistent. With such a short range, it means leaving your phone right next to the oven/grill. The whole point of having the info at your finger-tips is lost. 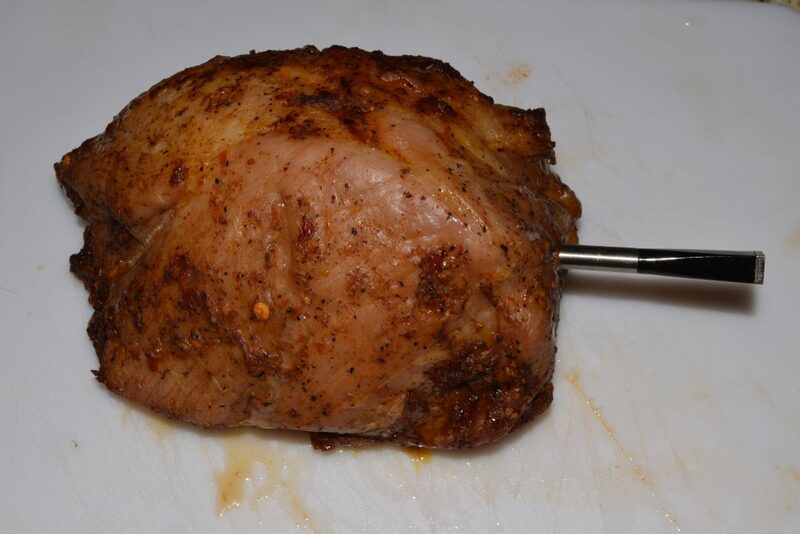 You might as well be using a meat thermometer/digital thermometer at a fraction of the price. 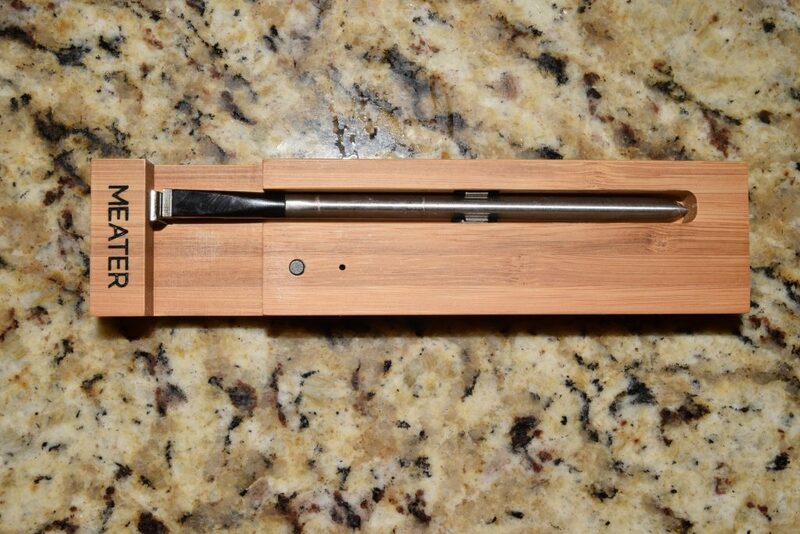 There is a way to incorporate a second device and extend the range, but I am sure that I am not alone in thinking that the Meater falls far short of what is promised. Perhaps I have a lemon? I doubt it, but I will give the company a chance to make good. I will give you updates if anything changes. Great Idea. Lousy Manufacture Timeline. Painful and less-than-helpful email from the company. Outrageous delivery time – 10 months. Well designed appearance. Professional and impressive packaging. Great app with excellent support videos. Excellent functionality. 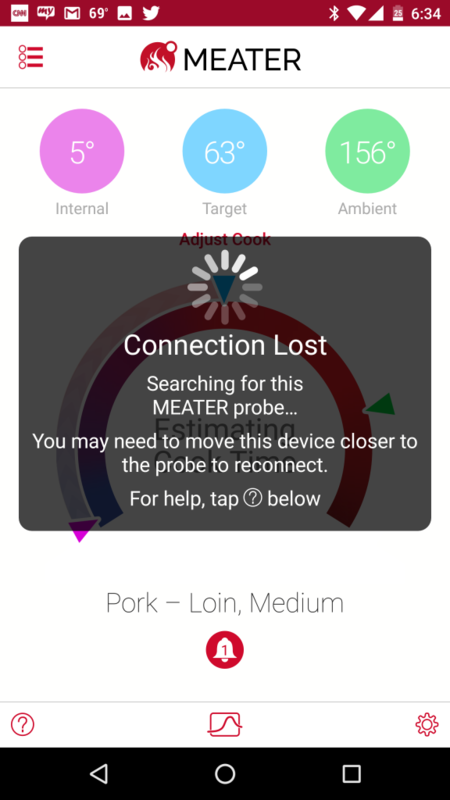 All of this is undermined by the appalling range of the bluetooth connection, which renders the app useless or makes your phone hostage to the oven/grill. Let’s see if the company has any input. Check back for updates. I am sending them the link to this blog post now! We’re open to conversation, shoot us an e-mail if you’d like.